Britain is to take a leading role in next-generation air power, as Defence Secretary launches a new national Combat Air Strategy at Farnborough 2018. 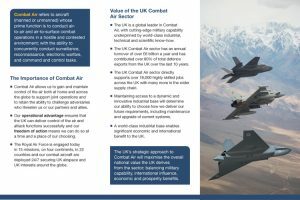 Press Release, 16 July 2018: Setting out Britain’s determination to remain a world-leader in the combat air sector, Defence Secretary Gavin Williamson has today unveiled a concept model of a brand-new, next-generation fighter jet as he launched a comprehensive strategy with a bold statement of intent for future British air power. Announcing the publication of the new Combat Air Strategy at the Farnborough International Airshow, the Defence Secretary said he had taken action to strengthen the UK’s role as a global leader in the sector and to protect key skills across the UK industrial base. 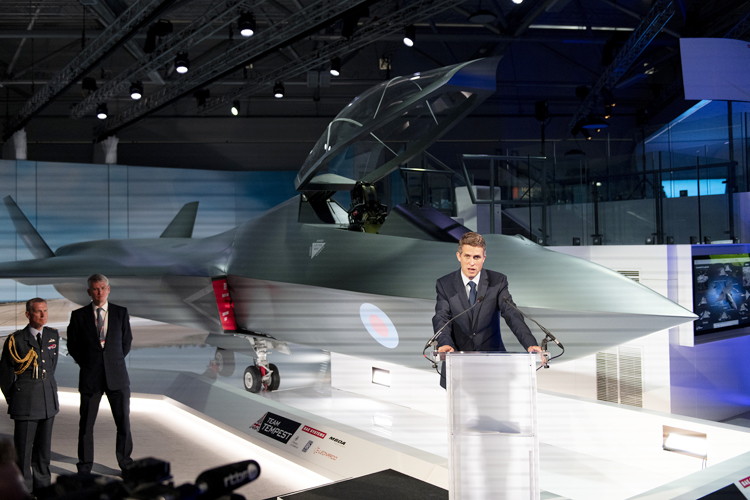 He outlined the Strategy in front of the combat aircraft concept model which has been developed by UK industry in collaboration with the Ministry of Defence – being publicly unveiled for the first time, it acts as a powerful demonstration of the UK’s world leading technical capability and industrial expertise. 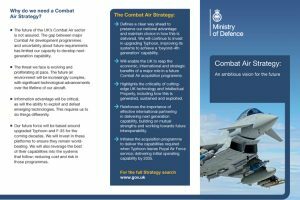 Defence Secretary Gavin Williamson said: “We have been a world leader in the combat air sector for a century, with an enviable array of skills and technology, and this Strategy makes clear that we are determined to make sure it stays that way. It shows our allies that we are open to working together to protect the skies in an increasingly threatening future – and this concept model is just a glimpse into what the future could look like. “British defence industry is a huge contributor to UK prosperity, creating thousands of jobs in a thriving advanced manufacturing sector, and generating a UK sovereign capability that is the best in the world. Early decisions around how to acquire the capability will be confirmed by the end of 2020, before final investment decisions are made by 2025. The aim is then for a next generation platform to have operational capability by 2035. 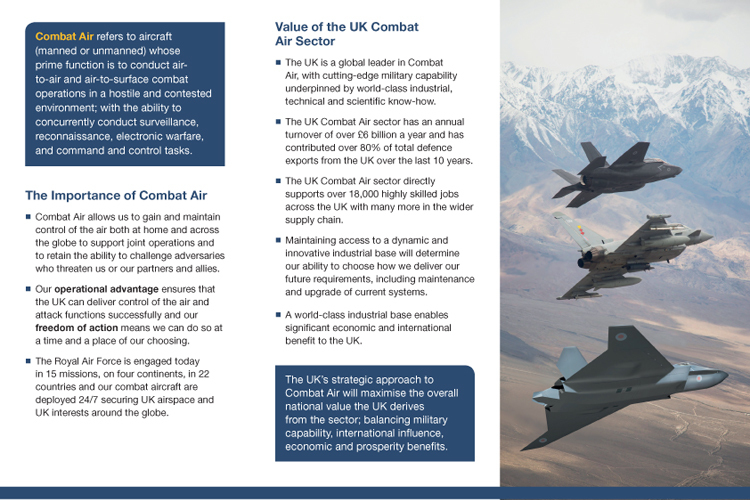 The UK is already a world-leader in the combat air sector, with a mix of skills and technologies unique in Europe, supporting over 18,000 highly skilled jobs. The sector delivers a turnover in excess of £6bn a year and has made up over 80% of defence exports from the UK over the last ten years. The F-35 Lightning II and the Typhoon are two complementary multi-role combat aircraft that will make up the RAF’s combat air fleet, placing the UK at the forefront of combat air technology – with the Typhoon expected to remain in UK service until at least 2040. Footnote: It is anticipated that Tempest should take over from Typhoon in RAF service from around 2035.